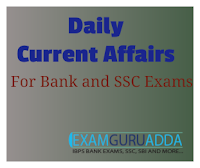 Dear Readers, we are presenting Daily Current Affairs for All Exams- 8th December 2016. 1. English has been ranked first in the top 10 most powerful languages in the world according to the 2016 World Power Language Index (PLI). 2. The index was published by World Economic Forum (WEF). Indian language Hindi was ranked 10th in the 2016 PLI. 1. The Union Cabinet has approved the development of Phase – 1 of the Pune Metro Rail Corridor Project. It will be covering a length of 31.254 km comprising with two corridors Corridor-1 (Pimpri Chinchwad Municipal Corporation to Swargate) and Corriodor-2 (Vanaz to Ramwadi). 2. Corridor-1 will be covering length of 16.589 km of which h11.57 km elevated and 5.019 km underground. Corriodor-2 will be covering 14.665 km and will be fully elevated. The project is scheduled to be completed in five years from the date of start of work as per the Detailed Project Report (DPR). 1. Allahabad High Court on 8 December 2016 declared‘Triple Talaq’ as unconstitutional. The single judge bench of Justice Sunit Kumar observed that no Personal Law Board is above the Constitution. 2. The verdict was pronounced while deciding two separate writ petitions that the ‘Triple Talaq’ practice, sanctioned under Muslim personal law that governs marriage, property and divorce - violated the rights of Muslim women. 3. Incidentally, the practice of ‘Triple Talaq’ has been challenged in the Supreme Court of India by several women. The Union Government has told the top court that it is against gender justice, equality and the Constitution. It had said that the issue of the validity of triple talaq, polygamy and nikah halala should be considered in accordance with the principles of gender justice as well as dignity and equality. 1. Himachal Pradesh has become the 18th State to join UDAY, a central scheme for revival of debt stressed power distribution companies, availing a net benefit of about ₹823 crore. 2. Government of India signed a Memorandum of Understanding with Himachal Pradesh and state Discom under the Ujwal Discom Assurance Yojana (UDAY) today, for operational and financial turnaround of the Discom. Himachal Pradesh is the 18th state to sign MoU under UDAY. 1. The railways today launched a website seeking inputs from all stakeholders to prepare the National Rail Plan (NRP) which will be ready by the middle of next year. 2. “Railways has prepared vision documents but never National Rail Plan. Railways being the government organisation is always subject to lot of pull and pressure. 1. The Union Cabinet has approved Memorandum of Understanding (MoU) between India and Vietnam on Cooperation in the field of Information Technology. 2. The MoU aims to develop sustainable and a long-term cooperation between both countries on the basis of equality and mutual interest in the areas of IT.